Currently the three days of October 4, 5 and 6 are festival days. On the first day is an evening festival, and the taikodai (decorated floats with traditional Japanese drums) of the 7 neighborhoods gather in the center of the city and the Japanese lanterns on the taikodai are simultaneously lit with sacred flame of the Nihonmatsu Shrine. On one taikodai there are around 300 Japanese lanterns in combination with atmosphere of opulent festival music, the parade is a magnificent spectacle. The most interesting part of the lantern festival is the evening festival on the first day. On this day, the 7 taikodai adorned with abundant Japanese lantern move out enmasse from each neighborhood and red lanterns are lit from a flame from the bonfire of Nihonmatsu Shrine. The taikodai valiantly move through the city while the "wakaren" shout in unison accompanied by traditional musical instruments. Thousands of lanterns moving while burning the night sky and even the hearts of tourists are warmed. Moreover, it is only on this day that all the neighborhoods are gathered together and have festivities in the evening. The day on which the "mikoshitogyo" (carrying miniature shrines) is the most important event of the annual festival. The 7 neighborhoods' joint celebrations also occur the second day, departing from the front of the station around 8時30 am, until around 3 pm. After that the mikoshi isbrought into the main hall of the Shrine and in the evening the taikodai return to each neighborhood, the Japanese lanterns are relit and paraded through the neighborhood. The last day of the festival. 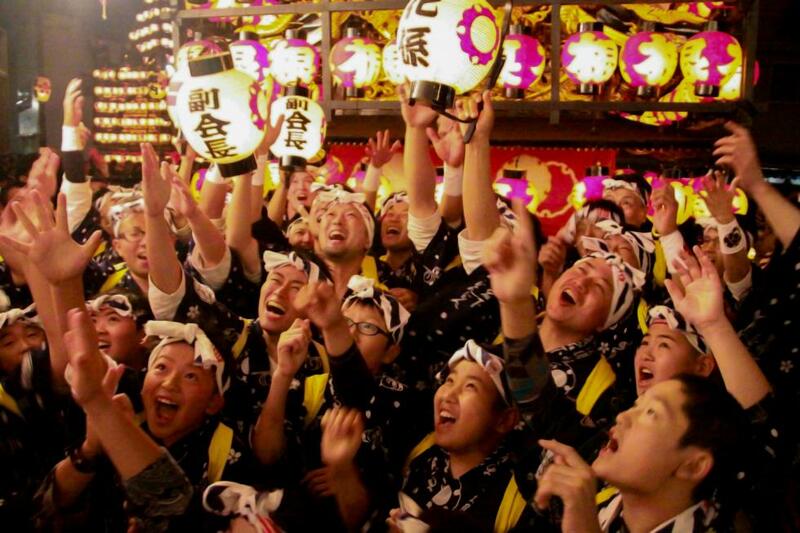 In the afternoon, the mikoshi returns to their respective neighborhoods and, in the evening, they are divided into two groups, 4 neighborhoods and 3 neighborhoods,and then the mikoshi isjointly paraded through the neighborhoods. Even after making one round, there is a remaining sense of longing and the sounds of the traditional Japanese instruments do not readily stop resonating in the full sky. Although each neighborhood differs, there are about 300 individual lanterns for each taikodai. The name of each neighborhood is printed on each lantern, so you can tell which neighborhood at a glance. The shaking of the taikodai is very intense - particularly on uphill slopes - there are cases when the Japanese lanterns catch on fire. All these are made by the city's lantern makers. A takahari lantern is a lantern with the name of neighborhood printed on the lantern attached to the top large bamboo stick and one is attached to the front of and to the back of the taikodai and each neighborhood is bounded by the takahari lanterns. In principle, they are prohibited from entering other neighborhoods. Although the titles of the positions differ from neighborhood to neighborhood, but there is a person in overall command of the taikodai who cannot handle the steering wheel and is responsible for the total operation. While walking backwards in front of the taikodai, he leads the movement of all the wakaren by the sound of wooden clappers and the pose of the rhythm and gives instructions of start, stop and the movement of direction. These arepersonswho climb to the top of the roof of the taikodai and, primarily, operate the "suginari" (cone shaped top of the taikodai). In addition to monitoring electricity lines, elevated candle replacement is also an important task. Sometimes they lean forward from the roof and enliven the festival with ebullient rallying cries. Although they are somewhat different in each neighborhood, the height is 11 to 11.5 m above the ground and they are movable. Lanterns are also attached at the tip made by breaking bamboo poles. Candles that are about the size of a cigarette are replaced. The number of candles that are normally used exceed 1,500 per one taikodai. The used candles are left in the Japanese lanterns. The dexterity of the wakaren changing candles is one of the highlights of the festival. The musicians who ride on the taikodai are composed of 1 large drum drummer, 3 small drum drummers, 3 to 5 flutists and 1 gong player, etc. The wakaren are responsible for the large drums and flutes and kowaka,sitting in the front row, are responsible for the small drums and gong. There are various characteristics for each neighborhood, and all the remaining songs of the 7 neighborhoods are designated as important intangible folk cultural properties. Wooden wheels cannot be operated by a steering wheel and turning around one of the four wheels, turning direction is very difficult. Steel is used on the portion of the wheel attached to the main body of the taikodai. There are various ways of turning the taikodai, for example, insertinga small wheel below the wheel and rotating with brute force, etc.